With arguably the year’s greatest cast, American Hustle is an immensely entertaining crime film. This cinematic menagerie is populated by a variety of conniving, unhinged and at times ridiculous characters. It’s fascinating to sit back and watch them interact with one another as the stakes spiral out of control. This film is blessed with an exceptional script. Director David O. Russell (The Fighter, Silver Linings Playbook) proves once again he’s the master of wrangling absurd characters. Like Quentin Tarantino, Woody Allen or Martin Scorsese, David O. Russell is able to draw phenomenally talented actors to his projects and bring them together to form an effective team. This film boasts the likes of Bale, Adams and Cooper but also Jeremy Renner, Jennifer Lawrence, Michael Pena and many more which I won’t spoil. Whilst each actor brings their own particular brand of kookiness to the film; Christian Bale, Bradley Cooper and Jennifer Lawrence shine the brightest. Now before you roll those pretty eyes of yours, I won’t be singing the praises of Jennifer Lawrence as per usual … but let me just say it’s kind of crazy that she’ll have this film and Hunger Games: Catching Fire out at the same time. There that’s it … she rocks. Bale, who has yet again transformed physically for a role (surprise surprise) is great as the loveable rogue leading this film. He’s part schmuck, part swindler with a dash of Robert De Niro’s Jack La Motta from Raging Bull (1980). Whilst Bradley Cooper isn’t quite at leading man status just yet, he shows he’s not far off, as he displays both his sense of comedic timing and the full range of his dramatic capabilities . He plays a character that you’re never too sure if he’s out of his depths or the smartest guy in the room, a role definitely suited to Cooper. The writing duties are shared by Eric Singer and David O. Russell. They are able to structure the script around a variety of scenes which contain multiple characters exchanging rapid fire dialogue with one another, which compliments Russell’s directing style nicely. This is a witty and well crafted script with little callbacks woven throughout, which are hilarious. The characters are each given defined arcs which never feel too contrived. 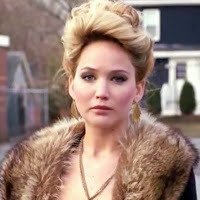 David O. Russell has faithfully recreated the late 70s; from the flamboyant outfits to the outrageous hairstyles and even nailing the technological advances. This feels like an authentic world he’s playing around in. I like that American Hustle stylistically is such a departure from his previous films, yet he is able to keep the overall themes and ideas relatively grounded. He’s still exploring relationships dynamics, a changing society and how we strive for what we truly desire, which he’s looked at in several films. I wouldn’t say this is a particularly ambitious film; however I had a huge amount of fun with it. American Hustle is a must see film over your Christmas holidays. I can’t wait to sit down and watch this again. If you see the film and agree or disagree with my review, feel free to leave a comment below.